Whether you’re a seasoned DIYer or trade professional, installing a floor-heating system can feel overwhelming if it’s your first time. But don’t worry, WarmlyYours Radiant Heating has you covered. 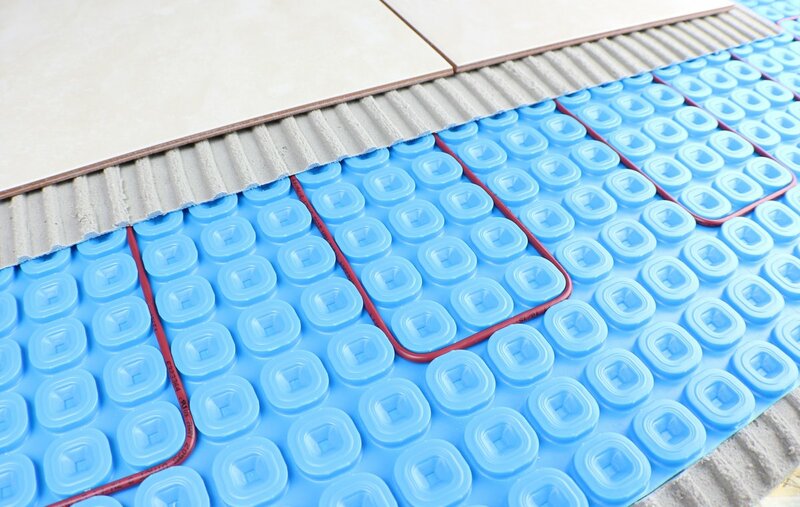 We’ve identified the easiest way to install a floor-heating system and we’re giving you step-by-step instructions on how to do so. 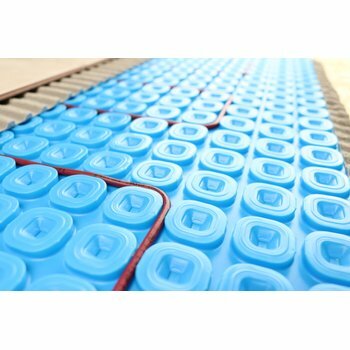 Because of its thoughtful design and fast curing time, the Prodeso Membrane is the easiest way to install a TempZone™ floor-heating system. 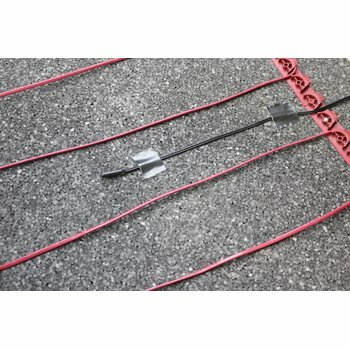 The membrane features rounded square-shaped reliefs that hold the cable in place and maintain a consistent 3.75-inch spacing. Because it is independent from the subfloor, it also offers crack prevention in the tile above. Plus, the thinset that’s recommended allows it to cure much faster than usual. An entire floor-heating and tiling project can be finished within a day. With any floor-heating project, the first step is making sure the subfloor is clean and clear of any debris, oils and greases that could impact damage the membrane or prevent adhesion. Be sure to remove any loose nails or staples in the subfloor and sweep or wipe up any debris. Measure the area you plan to heat and cut the Prodeso Membrane accordingly. Before you adhere it to the subfloor, you can actually lay out the membrane on the floor to make sure that it lines up correctly and covers the areas you need it to. This will save you time when you’re ready to spread the thinset. If your subfloor is wood or cement, you should use a latex-modified thinset between the subfloor and Prodeso Membrane using a ¼-inch notched trowel. 4. Adhere the membrane to the subfloor. Once the thinset is spread, install the pre-cut pieces of the membrane by pressing them down using a roller or plastic flat trowel. Now, you’re ready to install the heating cable! 5. Test the heating cable. Use a digital ohmmeter to test the heating element. 6. Connect the heating element to the thermostat. Connect the cold lead wire and floor temperature sensor to the thermostat electrical box. At this time, you should also connect a Circuit Check to the wires to make sure they are in good working order. 7. Lay out the heating cable. This is where the Prodeso Membrane really shines. It’s outfitted with rounded square-shaped reliefs perfect for holding your heating cable in place and keeping it properly spaced. Follow the pattern specified in your custom installation plan to lay out the cable. You can use a flat trowel to help press the cable between the reliefs, if desired. 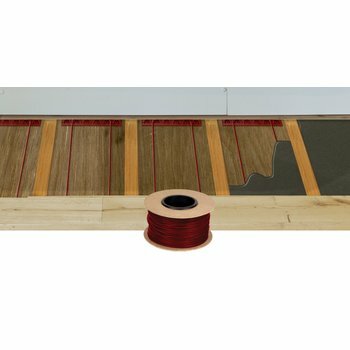 When you’re finished, lay the floor sensor in an open loop so that it isn’t touching the heating cable. Spread unmodified thinset over the top of the membrane using a notched trowel. Although modified thinset is typically used in tile and floor heating projects, it’s important to use unmodified thinset between the Prodeso Membrane and the tile or stone above. This will ensure that the thinset cures properly and quickly. 9. Install the tile or stone flooring. Lay out the tile or stone flooring quickly after spreading the thinset to ensure good adhesion. If you’re installing tile, you can consider using a tile lippage control system to make sure the floor is completely level. 10. Test the heating element. Using a digital ohmmeter, test the heating element a final time to make sure the readings are within the initial range. If they are, install your floor-heating thermostat and you’re ready to heat! To see these steps in action, check out the video below. For full, detailed installation instructions, please read the Prodeso Membrane manual. If you want to waterproof your Prodeso Membrane, you can also find directions in this manual. If you have any additional questions, feel free to call WarmlyYours any time at 800-875-5285. If you're curious about whether or not floor heating can serve as the primary heat source in your project, make sure to check out our free Heat Loss Calculator tool.